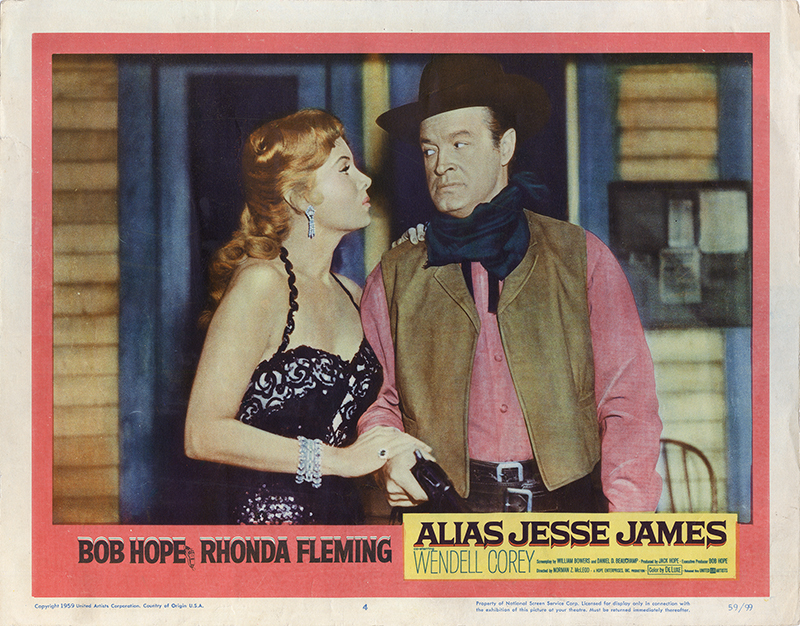 SCVHistory.com LW3313 | Jauregui Ranch | Bob Hope, Rhonda Fleming in 'Alias Jesse James' (UA 1959). Bob Hope, Rhonda Fleming in "Alias Jesse James"
Rhonda Fleming and Bob Hope star in the 1959 comedic Western from United Artists, "Alias Jesse James," partially filmed at the Jauregui Ranch in Placerita Canyon. Lobby card, 11x14 inches, No. 4 of 8, licensed for distribution by National Screen Service. NSS number 59/99 in lower right-hand corner, meaning the year is 1959 and it's the 99th film handled by NSS that year. It premiered March 20, 1959. Studio scenes were filmed at Paramount Studios in Hollywood. Additional locations include the Iverson Ranch in Chatsworth and Albertson Ranch in Westlake Village. This picture is rife with cameos, from Gene Autry and Roy Rogers to James Arness, Gary Cooper and Jay Silverheels (as Tonto). Featured cast includes Hope, Fleming, Wendell Corey (as the title character), Gloria Talbott, Jim Davis, Will Wright, Mary Young, Mickey Finn, Bob Gunderson, Fred Kohler Jr., Ethan Laidlaw and Glenn Strange. About the Andy Jauregui Ranch. The Andy Jauregui Ranch, originally the Clarence "Fat" Jones ranch, was located just east of present-day Highway 14 along Placerita Canyon Road. In its day (the 1930s), the Jones Ranch was next door to Trem Carr's original Monogram Ranch. Carr's original leasehold formed the nucleus of The Walt Disney Co.'s Golden Oak Ranch in the late 1950s. The Jauregui Ranch was actually owned by Standard Oil and leased to Jauregui — a major purveyor of stock and performers for rodeos, and an equestrian stuntman in the movies. According to Schneider Vol. 4 (2015:63), "In 1933, Jauregui bought out Jones' share when Jones moved his horse rental business to North Hollywood. The ranch buildings and ranch house were all actual working buildings for the ranch. Chevron permitted the Jaureguis, Andy and his wife Camille, to remain on the property until they were either dead or no longer resided on the property. "In 1990, Andy died, and in 1996, Camille moved out and Chevron razed all of the biuldings on the land except for the ranch house. The property was then sold to its neighbor, the Golden Oak Ranch of Walt Disney." It wasn't an isolated instance. In the mid-1990s Chevron got rid of all of its nonproducing properties. Locally that included Mentryville in Pico Canyon and the Pioneer Oil Refinery property in Railroad Canyon, Newhall, among others. LW3313: 9600 dpi jpeg from original lobby card purchased 2018 by Leon Worden.